This week we made stacked cream puffs traditionally known as religeuses but with a twist, they were dressed up with fondant. 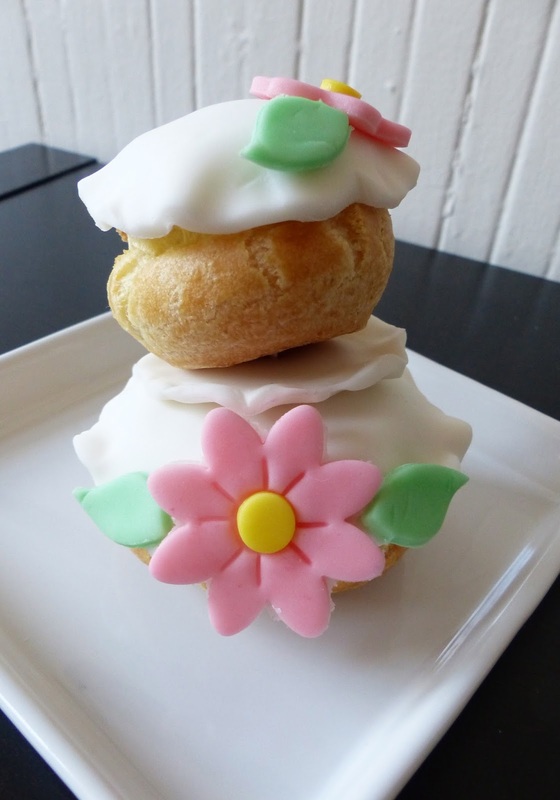 To make Miss Daisy, a small cream puff is used for the head and larger cream puff for the body. Then you're free to use your creativity with the fondant to create her ensemble. Here are our Miss Daisies. I planned ahead for this week's recipe by piping and freezing the appropriate sized puffs last week. So I just had to bake, fill and decorate them. I baked the puffs much longer than last week, an additional 7 minutes for the medium sized and at least 10 minutes longer for the larger ones. They came out perfectly hollow and airy. So last week I didn't bake them long enough. This is the first time a recipe in the book had an inaccurate baking time. I used leftover pastry cream to fill the puffs. I had some fondant stored away, which had gotten hard, but after a few good kneads, it was soft and pliable again. I tinted the fondant four different colors: pink, yellow, green and blue. I had a large daisy cutter, a small flower cutter and a small leaf cutter that I used, also the tip of a round pastry tip to cut out the centers of the daisies. I chose the prettiest and roundest of the puffs and proceeded to decorate! Since my daisies were on the large side, I only put one on each dress, and a littler flower on the hats. I couldn't manage the bows, but I did place cute green leaves by the flowers. It was difficult to balance the smaller puff on top of the larger one, so I used a toothpick to keep them steady. Overall, a very cute dessert, fun for parties, but too much work for everyday. I prefer the plain cream puffs. I gave my Miss Daisy a Parisian look with her chocolate petticoat, beret and hand bag. I actually made these puffs at the same time as the cream puffs I made last week and just baked the larger ones for a few minutes longer so they would crisp more. Cute little decorating project but if I were eating it, I'd prefer it dipped in a glaze rather than covered in fondant. I didn't have much time today so Miss Daisy didn't get all the attention she deserves. Nonetheless, she's cute and didn't take much time at all. I used Wilton fondant and leftover cream puffs. I should have cleaned up the edges before taking the picture :(. I gave her blonde bangs.